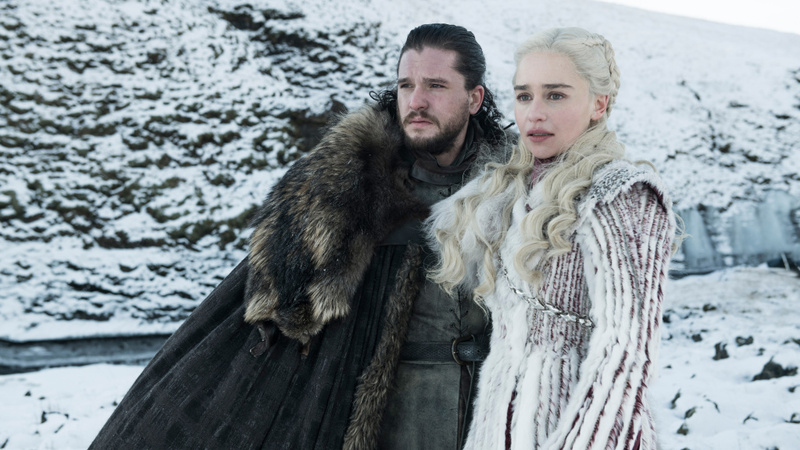 Will Jon Snow (Kit Harington) and Daenerys (Emilia Clarke) stay safe in the final season of Game of Thrones? Will their kicky winter camouflage help? "When you play the game of thrones," Cersei Lannister (Lena Headey) told Ned Stark (Sean Bean) icily — but of course she says everything icily — "you win ... or you die." Foreshadowing? To say the least. More like fiveshadowing. Because she said that to him way back in the seventh episode of Game of Thrones' very first season. It was May 2011, years before the show would become the inescapable international phenomenon it has, and two episodes before it would set itself firmly down the path to becoming just that, by killing off its nominal main hero, Ned Stark. Since that time, over the course of seven seasons, Cersei has been proven exactly right, again and again. There's been some small amount of winning, here and there, but just really a tremendous lot of dying — characters big and small, both the beloved and the benighted, have been poisoned, beheaded, slashed, gashed, stabbed, devoured by hounds, hurled from parapets, immolated, head-squished, pincushioned by arrows and — in one case — even died of old age, if you can imagine anything so grotesque. Now that we're entering the home stretch — just six episodes left, which will clock in at an estimated seven hours and twenty minutes, total — all the series' disparate storylines are crashing together, which can be depended upon to send its body count soaring. So let's make some predictions. These predictions are not based on anything but gut instinct. Nothing remotely spoilery lurks beneath them. Not knowledge gleaned from a close reading of the books, or from leaked on-set scuttlebutt, or anything, really, but a recent re-watch — and a reasonable understanding of how narrative arcs generally play out. Let's take the likely deaths in piecemeal fashion, because they tend to slot into discrete categories. These are the characters whose storylines seem most likely to end with a big, bold act of selflessness. Jorah Mormont — Here's a guy whose whole grizzled, whispery, mustard-shirted schtick revolves around sacrificing himself for Daenerys. It's just who he is. He may have started off the series as a mole in her camp, but the show's dragged him through a lengthy redemption arc that's involved saving her life repeatedly, suffering ignoble exile and one particularly nasty case of fantasy eczema. He'll go down fighting, but he'll go down. Jaime Lannister — He's come a long way, baby, and though from a story perspective it feels like he needs to see Cersei one last time before he dies, I suspect his end will come sooner. Maybe he ends up saving the life of Bran, the kid he sent plummeting from a tower? Nah, that's too tidy, but I don't see the Kingslayer making it out of season eight alive. Brienne of Tarth — A beloved character, whose entire being is dedicated to honor, nobility and goodness. On Game of Thrones. No, yeah, she's doomed. Theon Greyjoy — Another character whose long, grisly redemption storyline is finally over, which is great. Not so great: That means there's nothing left for him to do, dramatically, but to die saving his sister Yara. Davos Seaworth -- Look, I hope he makes it. And there's a good chance he might, better than anyone else in this category. After all, he's not a fighter, he's the kind of character the show seems to favor — the loyal, canny, good-hearted advisor. But there are big battles coming. Grey Worm -- He's a soldier. In war, soldiers die. And for the producers to really sell the tremendous human cost of the battles to come, they'll need to show us more than hordes of faceless Unsullied and Dothraki getting mowed down. They'll need to put a face on it — and show us Missandei, grieving his loss. Bran Stark -- Not sure about this one. But Bran's spent the last couple seasons as a living, breathing Encylopedia Westerosi, imparting crucial information for the other characters to act on. There doesn't seem to be a lot left for him to reveal. And the fact that he was marked by the Night King bodes, you know, just all kinds of ill.
Gendry -- Admit it, it would be just like this show to bring Gendry back after so long away, throw him into battle and have him like trip on a rock and die. He's Robert Baratheon's son, after all. These are the characters who've been set up — either by in-show prophecy, or just the simple, implacable demands of storytelling — to totally eat it, at some point in season eight. Melisandre — She said it herself. She's coming back to Westeros to die. Take the woman at her word. Arya Stark — This one's controversial, because there's no in-continuity prophecy about Arya dying — there's just, you know, the show. The producers want us to thrill at Arya's badassery, but also wring our hands over her lethal, ruthless nature. I'm calling it: At some crucial moment she'll be forced to choose between crossing a name off her list — a big one (Cersei? ), or choosing mercy. She'll choose the list, dooming herself. But she'll look great while she does so. Beric Dondarrion — He's been brought back for a purpose, we are assured. That purpose has got to be destroying the Night King. Once that mission is over, so is he. Jon Snow — I know, I know, one true heir to the Iron Throne, etc. etc. Doesn't matter. It's the Dondarrion rule: He's been brought back for a purpose and he'll accomplish that purpose. It'd be great if he could then retire to the Summer Islands with whatever the Lotus Port equivalent of a mai-tai might be, but that's not how this works, that's not how any of this works. These are the series' most hissable remaining villains; rest assured, not a one of them is gonna make it. Sure, the show's allowed their cruelty to thrive for multiple seasons, in most cases — but here at the end, justice has to find them. The Night King — He's a force of nature, he's blue-eyed soullessness, he's Death itself, sporting a bunch of teensy ice-cowlicks. More importantly, as we learned last season, killing him means killing every White Walker, and by extension, every wight, instantly. That's ... tidy. The show wouldn't have built that failsafe mechanism unless it intended to use it. The Mountain -- Cleganebowl will see everyone's favorite reanimated corpse (non-wight variety) going down. Qyburn — This guy's exactly the sort of creepy toady the series will delight in preparing a particularly nasty demise for. Euron Greyjoy — This cartoonishly cruel, one-note, bargain-basement pirate — Captain Jackass Sparrow — will go down, and go down hard. Probably at the hands of Yara. And it won't be nearly as surprising as the show wants it to be, because he's not so much a nuanced, believable villain as a plot device in guy-liner and leather pants. I dearly hope everyone in this category makes it through. I'd like to think the series will rise above the pernicious tendency to kill or abuse secondary characters (usually women) in order to inspire hero characters (usually men) into taking action. I'd like to think it won't happen. But then, I've seen the show. Gilly --Part of me thinks they wouldn't dare, because it's such a hack, obvious, tired cliche. But if they (wrongly) think they need to justify Sam leaping into heroic action, Gilly's a goner. Podrick -- If they want Tyrion or Brienne to get their vengeance on, they'll kill off Pod. These are the characters who will make it through, bloodied, beaten but unbowed. Tyrion Lannister — Don't get me wrong, it would be just like GRRM to off his most identifiable character (and most identifiable-with character, if you're one of his legions of "bookish-nerd-who-can't-fight" readers) at the last possible second, just when victory is at hand. But I see Tyrion making it through, barely. He's coming off two seasons as a pretty lousy strategic adviser, so let's close off that career path. Maybe he'll get that vineyard he always wanted. Samwell Tarly -- Well someone's got to stick around to write A Song of Ice and Fire (see above, re: characters with whom the author and his readers most closely identify). He dropped out of maester school, and, what, he's gonna go back to Castle Black to be a Watcher On The Rubble? I don't think so. After last season's Friar's Club Roast of his father and older brother (more like "Fryer's Club Roast" good night Cleveland) the family seat at Horn Hill is ... kind of super super open. Daenerys Targaryen — It's what the series has been setting us up for, all along: Young woman comes into her power, learns how to wield it with wisdom, compassion and restraint (or else what the hell was that interminable Meereen business for? ), experiences huge losses, and ultimately assumes her rightful place. (Forget Jon Snow — his status as the "true heir" means he would simply continue the cycle, and that's not how the show will send us out.) And yes, on one level, Daenerys assuming the Iron Throne would also represent a return to the status quo. Except it won't — all those references to how she wants to "break the wheel," to say nothing of the fact that the Wall is down, means that there won't be any status quo to return to. There also likely won't be an Iron Throne on which to sit. (Dragon fire forged the Iron Throne in the first place — fitting if it also destroyed it, once and for all.) I'd love for the show to legitimately surprise us, and having Dany assume power in some new, unlooked-for way would do that. Bronn — There are survivors, and then there are cockroaches. Bronn would find some way to survive, even if the Night King won — he'd wrap himself in rotting entrails and stagger around going "Argh, argh, got any mead argh, argh, argh." This guy rolls with any punch; he'll be fine. Sansa Stark -- In the books, she's an ancillary character, but the show's made her central, and put her through hell. She'll make it. She better. Lyanna Mormont — After forcing us to watch Shireen Baratheon go up in flames, I suspect the show's appetite for killing young women — especially fan favorites like the bluntly badass Lady of Bear Island — has been sated. Yara Greyjoy -- She'll assume her rightful place as the Queen of the Iron Islands, having kicked her worthless Uncle Euron to the briny curb. The Hound — Tough call. He could very likely die in Cleganebowl, because he's already been through a whole "almost dies, turns away from violence, whoops, nope, just kidding HACK SLASH KILL" arc. Doubtful they'd do that again. They've put in so much work supplying him with added layers over and above his need for revenge, I hope they'll let him live to explore them. There you have it. Again, wild guesses, all. I'll be recapping this final season of Game of Thrones here at NPR.org, so we'll have six opportunities to bask in my wrongness. I'll write them overnight, so check for them on Monday mornings, first thing. No okay yeah now that I think about it let's move Davos to the Safe category.